Now that we have that out of the way - let's get on to the recap! 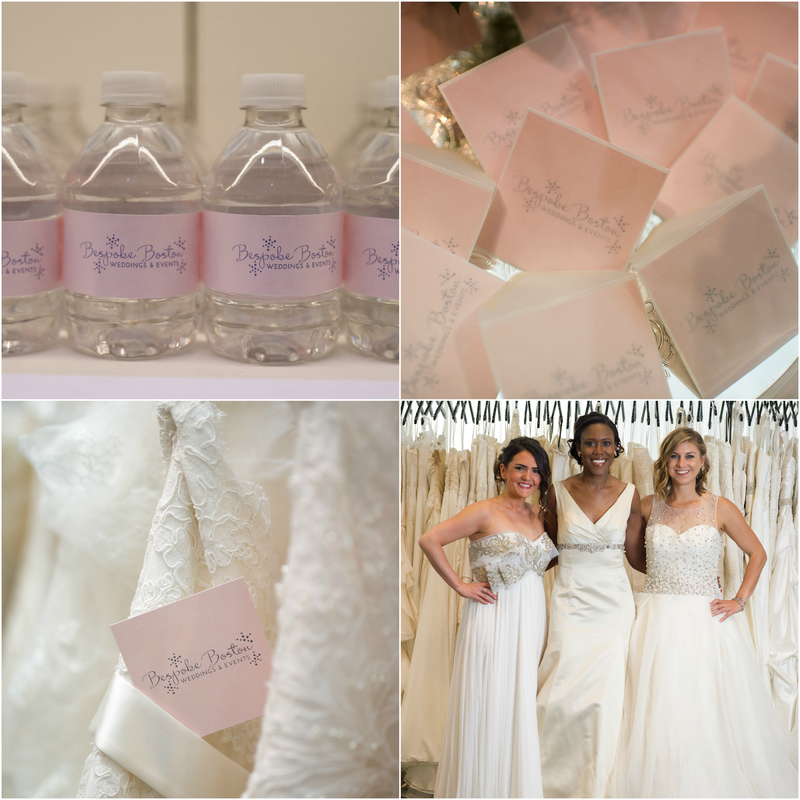 We were all about details for this event and wanted brides, friends and family to see that!! Our business cards and custom water labels were made by the incredibly talented Lynn from The Inviting Company. 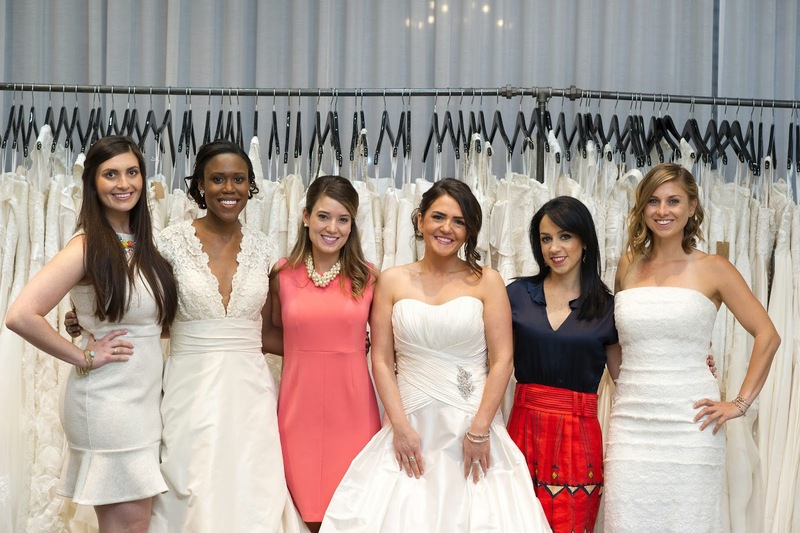 We invited three of our favorite Boston Bloggers to be the models for the night and Shauna, Georgina and Sarah could not have been more beautiful! 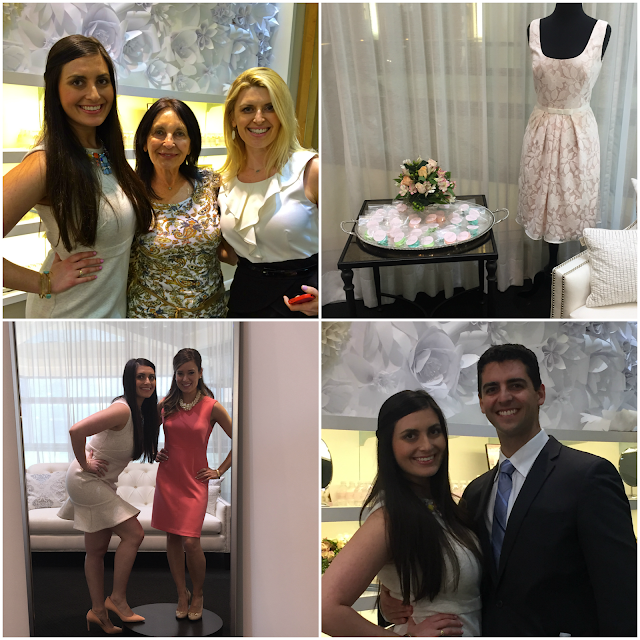 A huge thank you to Amanda from Fabulous Frocks Boston for opening up her gorgeous store for the event! 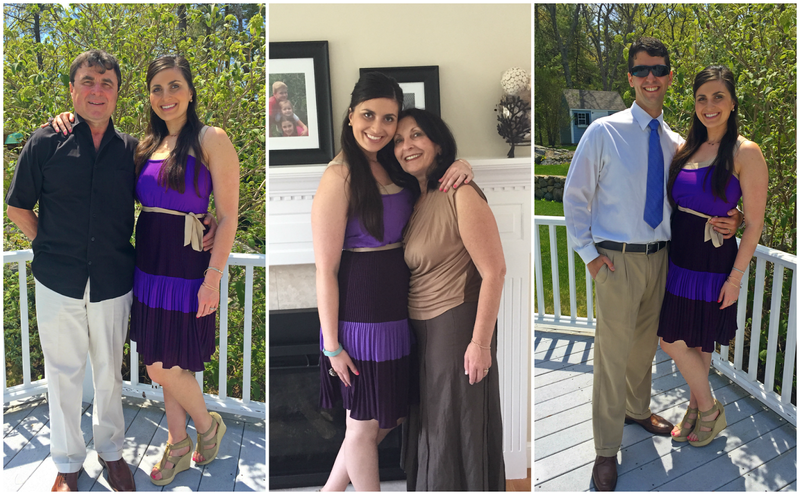 Without her stunning gowns there would have been no reason to have a Spring Dress Party!! We could not have been luckier to have Matthew, from Matthew Jason Photography as our photographer for the evening because he truly captured some fun moments and has a wonderful eye for details! Through looking at all these photos I've realized my "arm pop" is out of control!! My mom and I spent some quality time together on Saturday doing what we do best...shopping! I did something really out of character for myself - I bought this Longchamp bag and then promptly returned it and now I'm thinking about it again! I actually wanted to buy this bag in Paris and when I went back to get it someone had already bought it - then I couldn't find the style and sort of forgot about it and then Saturday saw it again...so here were are again, I'm still thinking about it and this time just waiting for it to go on sale and I'm going to get it! Sorry...that was really long winded! Ended up winding down the evening with a delicious glass of Riesling. Sunday we spent the day with my parents and sister and could not have had a more beautiful day - it hit 86 degrees and we clearly skipped Spring! You can find me at the gym this week!! How was your weekend? Hope you'll link up below to share with us! Looks like a fabulous weekend, lady! Love the dress you are wearing and that food looks amazing!!! I LOVED all of the details from the party!! And I'm so glad you enjoyed Sunday with beautiful weather. We did too! Oh, and I hope your bag goes on sale so you can snag it again. I'd like one too!! SO glad the event went amazing, I knew it would! And you looked gorgeous! And glad you and your mom had a great weekend. That bag is so cute and my philosophy on shopping is, if you see it and love it but can't decide whether to get it, walk away. If you're still thinking about it later and you go back and it's there, it was meant to be ;) Happy Monday love! What an amazing event! It looks like your hard work and planning paid off! Loved your photos!! I knew your event would be glorious. Love the pics! Adore your dress and so glad the weekend was wonderful for you! You work hard and deserve some relaxation. Makes me want to sit by the pool and have a glass of Riesling with you. My favorite! So glad that the event went well!!! Sounds like you had a great weekend (it did totally skip over Spring and head right into Summer--we have a 90 degree day this week!) Love the bag that you bought...then returned haha. I think you are having reverse buyer's remorse where you regret NOT getting something. Definitely get it if/when it goes on sale! What a beautiful event! It looks like you had a very fun filled weekend, and I will definitely be at the gym this morning too! Yeah!!!! I'm so happy to hear the event went so well (even though there was no doubt in my mind ;-) Girl I do that same thing with bags (or really any high ticket item). Send me the link I'll start working on some coupon codes lol. You looked so gorgeous this weekend! I loved that picture with your momma! I'm sooo glad we got to see more pics of the event today! It really was incredibly gorgeous Biana!! I love that back but I know about Longchamp prices too so I get it lol. So glad you got to have a relaxing weekend with your family! That poolside picture looks amazing. Perfect way to end a day. It was gorgeous this week but a little hot for my taste. Where did Spring go?! P.S. YAYYYY for the GFC widget, my Bloglovin has been acting up big time lately and I'm mostly using GFC again. Glad we have both for when one is not cooperating. Awesome weekend! Glad you were able to spend time with the fam, that's the best! Your event looks spectacular. Great job ladies! I removed GFC from my sidebar. So annoyed with Bloglovin' right now. Nothing is showing. I'm feeling so out of the loop! LOVE the new design! It looks like your event was also a success, so congrats!!! OMG all of that yummy food! Looks like a great weekend! Your event looked like it turned out wonderfully! So pretty, and you had some great attention to detail. Congrats!! It's so funny, when I look at pics of myself from an event or from one evening, I'm always like, "why did I make that face in EVERY photo?" or "why did I tilt my head like that... In every single pic?!" Haha! I love the pics from your event! Those desserts! I don't think I could restrain myself! What a great weekend! So glad that the event went well! You're too funny with the purse...why are you hesitant about it? And your Mother's Day stuff looked like fun! Those desserts! 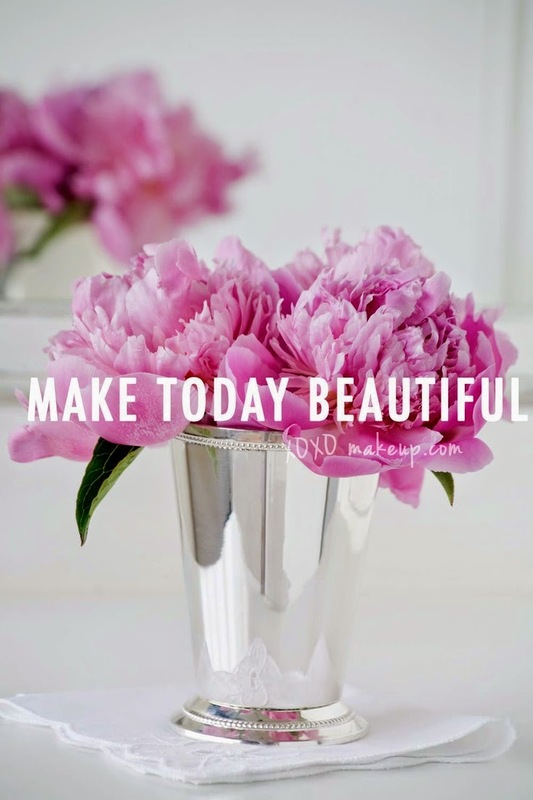 Have a great week, Biana! CONGRATS on your LAUNCH! How amazing-it looked beautiful :) And go for the bag. I've had my Longchamp for 6 years and love it! Looks like your launch went wonderfully! Yay!!! I'm so glad that your launch went well, sorry that I missed it. Let's discuss this orange bag! It's FAB! I have the navy one in the tote version, LOVE IT!! You totally should get it. Looks like it was a great weekend, great pictures!! Love that dress you are wearing. so happy to hear the event was a success!!! Ohhhh my that food looks amaze!!! And you look beautiful! Sounds like a perfect weekend. I really wish I was sitting at that pool with a glass of wine right about now…. What a perfect weekend!! LOVE your dress that you wore at the launch party (and your arm pop ;)) And that food!! Perfect Mother's Day spread! Yum!! So glad you got to soak up quality time with your family! Looks like an awesome weekend! I'm so glad your event was a success - it looked great! I bought a Longchamp bag from the Saks outlet, it was definitely cheaper than at a regular department store. I use it all the time - it seems pricy for a simple bag, but they really are well made. The event looks like such good time and everything was beautiful! I love all the little details in things so of course loved all those little things! The time with your mom looked like so much fun and that dessert table.. yum!! The event looked gorgeous! Sounds like you had a wonderful weekend! And I love the bag! I've had my Longchamp for years and it's still going strong! I definitely vote for picking it up when it goes on sale :) Happy Monday! congrats again on the event, that is awesome! the details are fabulous. that orange bag - i think you need it ;) if you are still thinking about it! that's my motto lol. Your event looks like it came out beautifully! So happy for you! And if you're thinking about the bag that much I would just take the plunge and get it! The Spring dress party sounds like so much fun and glad it was a success! Looks like you got amazng weekend and shopping with your mom sounds like a great way to time Mother's day together. Absolutely gorgeous photos from the event Biana! So glad it was a success! Sounds like you had a great weekend!! So funny about the arm pop. Lol!! And if you're still thinking about the bag in a day or so, just buy it. Then you know it's definitely not an impulse buy, but something you really want!! That dress party looks so fun, and I am loving that orange bag. So fun and summery! Loving all the little details of your event...it looks like it was absolutely gorgeous! Congrats! Sounds like that purse is definitely something you should invest in. After all this time and your still thinking about it. I say go for it ;) Glad you had a great weekend Biana! And I'm loving the new blog design!! Beautiful photos! Sounds like a great event! Looks like everything went wonderfully!!!! ... fyi - don't know what's up, but on Bloglovin' - a few blogs aren't showing up till a day late... my own blog is doing that... don't know if you are having issues yourself? Frustrating! I don't wanna miss out on anything. Wasn't the weather this weekend beautiful? We totally did skip right past Spring - but you won't be hearing any complaints here! Yay for a wonderful event! And too funny about that bag! I absolutely love it! Glad you had a great Mother's Day weekend! Omg, dressing up in wedding gowns? Sounds like the best event ever! And lol to the arm pop comment - I have the same issue! Riesling is my favorite wine! Glad you had such a great weekend & the event went well. You always have pictures of the most heavenly looking food! I just want to try it all! The event sounds so fun! Too bad I dont live in Boston, as I'm starting to plan my own wedding! So glad your event went fabulously! Girl you keep going with that arm pop (ps look at ALL of my pics cause mine is out of control too)! That event looks amazing and it looks like it went so well! I am guilty of arm popping wayyy too much! Love that I am not the only one. Your mother's day plans looked amazing! Hope you had such a lovely weekend! Congratulations on your event! Beautiful pictures! It sounds like you had a wonderful weekend! That event looks so beautiful. Congrats on executing!! And that Mother's Day food looks suspiciously like mine… I'll be at the gym too!! those dresses are to die for, how beautiful! Sometimes it's good to splurge on yourself :) and that bag is gorgeous! I definitely say get it, maybe check ebay? Sometimes they have it for cheaper, that's where I got my bag from actually. Just have to find a reputable seller. Oh my gosh- that food looks divine!!! And so glad that your event went well- you looked gorgeous!! What an awesome weekend! You looked beautiful! the event looks so wonderful! That spring dress party sounds so fun! What a great event! Everything looks like it went perfectly for your event!! And I have the same arm pop problem - I blame it on my sorority days ;) Love that bag, you should totally get it! What a fun event! So happy to hear that your weather has improved:) I have an amazing giveaway up on the blog, I hope you'll check it out! I'm glad your event went so well! And I love the dress you wore! I hope I am that pretty when I am your mom's age! Oh my goodness! Your launch party looked amazing. I hope you share more photos later!! :) glad you enjoyed some time with your momma! That's the best! Wow! What a fun event!! It looks like it was amazing! Wonderful weekend and wonderful post! Love your new design and it looks so beautiful! It's so good to hear that you've had an amazing time! what a fantastic weekend! those labels turned out so cute! That bag is amazing!!! I can see why you keep thinking about it, hopefully soon it will be on sale! Fingers crossed. Looks like a great weekend, and yay for a successful event!! What a fun weekend! Jealous of your gorgeous weather! It rained all weekend and I don't think we even hit 50 degrees! I love the hand bag too! Looks like you had a great weekend! Glad the event was a success and I love the new blog design! The Spring Dress party looks like a blast...beautiful! So glad you had a great day with your mom Sunday! Love the dress you wore. Loving this weather too!! Have a great week! What a fun event and I love your white dress (you're kind of out shining the bride ;)!) Yay for the perfect Mother's Day with your sweet mama, too!